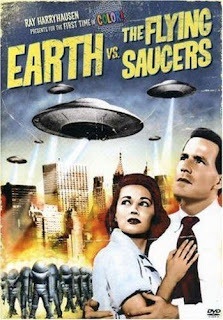 Today's Classic Reflections movie review is on Earth Vs the Flying Saucers (1956). A guest post by Sybil. The story in Earth Vs the Flying Saucers is set in “present times” meaning 1956. In the beginning of the film a narrator tells us that folk all over the world are seeing flying saucers and the government is seen hard at work collecting the stories from ordinary citizens, ala Project Bluebook, etc..
After the movie's titles, a scientist, Dr. Russel Marvin (Hugh Marlow) and his wife, Carol (Joan Taylor) are on their way to a rocket launch when they see a flying saucer. They’re not thrilled and they certainly are not telling anyone. Their project, called, Sky Hook, is an ambitious plan to launch satellites into orbit around the earth to collect atmospheric data needed to eventually “realize an ancient dream” of space exploration. The problem is that although the scientists have sent up 11 satellites, they have lost radio contact with all of them (except the last one they launched at the beginning of the movie.) The DOD is not happy about funding more. This is told to Dr. Marvin by none other than his father-in-law, a general who just got back from a trip to Panama. He went there to check out debris that fell out of the sky, turns out it was the remains of one of the Sky Hook satellites. So maybe we can’t entirely blame the humans when they open fire on a saucer that decides to land on a military base where the rockets are launched from. Seems that humans in the 50s thought it was better to shoot first and ask questions later (The Day the Earth Stood Still, another film with Hugh Marlow.) All this shooting makes the aliens mad, so they shoot back and the movie’s title is realized. While this is a B-movie, and not the most original story, it’s a worthy effort because it brings together a lot of interesting people. As mentioned above, the film stars Hugh Marlow, a face that will be familiar to you from The Day the Earth Stood Still – although he was not the man Patricia Neal thought he was. In this film he got to be the leading man for once. He’s joined by Joan Taylor, not very famous but she did do a lot of tv shows and B-movies so she fits in nicely here. The great Ray Harryhausen did the special effects for this film and they are pretty impressive for the time. The saucers look good up there spinning around. And the battle scenes towards the end of the film of the saucers attacking WDC, in particular our monuments, are iconic now in pop culture and the sci fi genre. Harryhausen worked extensively with producer Charles H. Schneer as the two were life-long friends. Together they made many great films including It Came From Beneath the Sea (1955), Mysterious Island (1961), Jason and the Argonauts (1963) and Clash of the Titans (1981). The films other producer was Sam Katzman, a man who worked his way up from errand runner to producer and director. Katzman was known as a penny-pincher, something that might not be as bad as it sounds. But he also had the knack of picking subjects for movies that were current and therefore usually good for ticket sales. He produced many films that capitalized on the latest craze, this film for instance (flying saucers) and several other “firsts” including a movie about rock and roll music (Rock Around the Clock, 1956) and juvenile delinquency (Teenage Crime Wave, 1955 also with Fred Sears directing.) What I like about him was that he frequently tried to employ writers who were on the Hollywood Blacklist. The film was directed by Fred Sears, a former actor (B-movies of course), who – in his very short career – directed a lot of B-movies for Columbia Pictures, including many westerns. He made a few sci fi and horror films including The Giant Claw (1957) and The Werewolf (1956). Sadly he died at the very early age of 44 of a brain hemorrhage. The film was based on ideas about flying saucers proposed by former US Navy officer Donald Keyhoe. Any UFO buff worth his/her salt should know that name. Keyhoe was an outspoken critic of what he thought of as government secrecy on UFOs and also prolific writer on the subject, writing both fiction and non fiction stories for many magazines ranging from Weird Tales to The Saturday Evening Post. This film is in black and white and about 1 hour and 20 minutes long. Earth vs. the Flying Saucers (Color Special Edition) On IMDb, users have given it a 6.4/10!